Offering accounting, tax, and management advisory services for businesses in Bradley, Hamilton, and McMinn counties. Specializing in strategic planning and accounting systems consulting. Based in Cleveland, Tennessee. Accounting firm loacated in Beaumont, Texas, offering accounting services, consulting, accounting software, and tax services. CPAs providing accounting, tax, and consulting services to the Treasure Valley area (offices in Boise and Fruitland). Accounting system consulting services includes QuickBooks Pro. Offers accounting, tax, and management advisory services for businesses in Bradley, Hamilton, and McMinn counties. Specializing in strategic planning and accounting systems consulting. Provides tax preparation and accounting services. Offers the firm profile, client services and financial tools. A Long Island, NY CPA firm providing accounting, tax, QuickBooks and incorporation services. Niche accounting services for Hedge Funds, construction and professional services. Includes Tax Tips and financial calculators. Financial and accounting services company offering accounting, bookkeeping, payroll, tax, and other related services. Taylor Mill, Kentucky firm provides accounting, bookkeeping, tax preparation, typing, and data entry services. Bellingham CPA firm providing integrated accounting and consulting services by coordinating audit, accounting, and tax services. Offers services in management accounting, individual accounting, tax planning, computer consulting, and auditing services. Cleveland, Akron and Cincinnati accounting firm specializing in traditional accounting, auditing, small business and tax services. Fullerton, CA firm offering accounting and payroll services to small and medium business. Providing tax, business services, financial planning and management accounting services. Located in Ramsgate. Providing accounting, tax, and other financial services to small and medium size businesses. Includes services available, and contact information. Hillsborough firm offering accounting, tax preparation, financial statement, and reconciliation services. Offers accounting and tax services in the San Fernando Valley. Los Angeles (downtown) Enrolled Agent provides tax preparation and accounting services. Includes on-line tax organizer, service-bureau-supplied newsletter, financial calculators, and tools. Site provides student resources on accounting careers, including information on finding accounting jobs, learning accounting skills, and other aspects of the accounting profession. Accounting firm in Jackson providing financial, tax, and accounting services. Provides accounting and invoicing services for all industries. Located in Jackson, Michigan. operational accounting, land administration and production accounting outsourcing services. CPA provides accounting and tax services for small businesses that use Quickbooks accounting software. Seattle firm provides out-sourced accounting and bookkeeping services. If the business hours of KM Accounting and Consulting Service in may vary on holidays like Valentine’s Day, Washington’s Birthday, St. Patrick’s Day, Easter, Easter eve and Mother’s day. We display standard opening hours and price ranges in our profile site. We recommend to check out kmacs.com/ for further information. 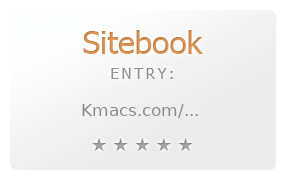 You can also search for Alternatives for kmacs.com/ on our Review Site Sitebook.org All trademarks are the property of their respective owners. If we should delete this entry, please send us a short E-Mail.